Memorial Days – every day's a holiday! The long and brutal battle for the Dardanelles is one of the most commemorated campaigns of the 20th century. Australia and New Zealand remember the Battle of Gallipoli each year on April 25, the anniversary of the first engagement of ANZAC (Australia and New Zealand Army Corps) in World War I. Turkey, meanwhile, remembers the nine-month campaign each year on March 18—the anniversary of the 1915 naval battle of Canakkale which, had the Allies succeeded, would have paved the way for the capture of Istanbul. Turkey calls March 18th the “Victory of Canakkale”, or the more sobering title Martyrs’ Day. The Allies’ plan was to combine their naval strength to blast their way through the Dardanelles, a stretch of water connecting the Aegean Sea to the Black Sea. The Dardanelles are 60 km long and a maximum of 7 km wide. At its narrowest point (appropriately named “the Narrows”) overlooked by the city of Canakkale, the shores are separated by a mere 1600 feet. By taking the Dardanelles, the Allies, led by France and Britain, would have a route from the Mediterranean to their Russian Allies, while cutting off the Germans from their ally the Ottomans (Turkey was part of the Ottoman Empire at the time), effectively removing the Ottoman Empire from the war. However, on March 18, after a month of French and British naval bombardment, the Allied attempt to breach the Dardanelles met a disastrous failure. The fleet failed to clear the minefields strategically placed by the Ottomans and several key British and French warships were destroyed. It became clear to the Allies that Turkish resistance was too strong for a purely naval victory. They sent in ground troops, including tens of thousands of eager Australian and New Zealand recruits. Against the armed might of four nations, including two of the most powerful navies in the Western world, Turkish armed forces held their ground for a full nine months. The long campaign and victory in January 1916—like the initial victory on March 18, 1915—fueled national pride and cohesiveness across the land that would be Turkey. Much of the success of the defense of Canakkale is attributed to the strategic foresight of a young commander by the name of Mustafa Kemal. 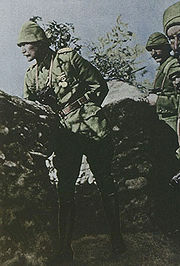 After World War I, Mustafa Kemal went on to lead forces in the Turkish War for Independence, and became the founder and leader of the new nation of Turkey. He is probably the most significant figure in the creation of of Turkey as we know it today, and because of the significance of Canakkale, many view 1915—not 1923—as the true birth year of the Turkish state. One side won, one side lost. But statistics tell another story. The Turks and the Allies suffered nearly a quarter million casualties each—that’s over half of all men on both sides who fought in the nine-month battle. “Kneel where our loves are sleeping. They lost but still were good and true. The following year the Commander of the U.S. Army, moved by the ceremonies of the South, declared a similar tradition in the North. Three decades after the Civil War, Richard Burton wrote his famous “Memorial Day“. How Lincoln and Lee are friends, and understand. All nations living in love’s great release. Southern states still observe separate dates for honoring the Confederate dead. After WWI, Memorial Day included remembering the dead of other wars, not just the Civil War. To date, more Americans died in the Civil War than in all other wars combined. Two years ago, I was informed by a reader and friend that it is the duty of Every Day’s a Holiday to warn unsuspecting visitors to South Carolina not to bother going to the DMV on May 10. Any such excursions will certainly result in failure. For today state offices, banks, and businesses shut down to honor the memory of Thomas Jonathan Jackson, a man better known by his nickname: “Stonewall”. Jackson has one-and-a-half holidays devoted to him. South Carolina commemorates the anniversary of his death on May 10, while Virginia combines the birthdays of Jackson (January 21, 1824) and Robert E. Lee (January 19, 1807) to celebrate Lee-Jackson Day. Jackson lost his father and mother at an early age, and was raised by relatives. The orphan attended the U.S. Military Academy at West Point, and despite starting with an educational handicap, he graduated 17th out of a class of 59. He then served in the Mexican-American War, and taught at the Virginia Military Institute. Three months after the outbreak of the Civil War in April 1861, Jackson was promoted to Brigider-General. At the First Battle of Bull Run, when Union forces broke through Confederate lines, Jackson’s troops stood their ground defending the hill, causing Confederate General Barnard Bee to exclaim to his men, “There stands Jackson like a stone wall!” The name stuck. “Stonewall” Jackson and his “Stonewall Brigade” became symbols of Southern bravery. Of course there may be another reason Jackson stood like a stone wall. As a student at West Point, one of Jackson’s many eccentricities was a belief that, if he bent over, it could damage his internal organs. Jackson was one of the greatest military strategists in U.S. history. By October he was promoted to Major General. He led his troops to striking victories in the Shenandoah Valley Campaign. 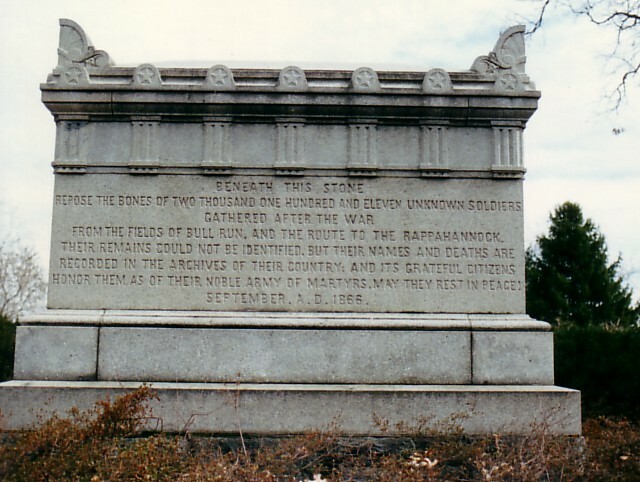 The Stonewall Brigade distinguished itself at Antietam and numerous other battles. It’s been said that had Jackson lived long enough to assist Lee at the Battle of Gettysburg, the South might have won the war’s bloodiest stalemate, and maybe even the war. But it wasn’t to be. Jackson met his end at the Battle of Chancelorsville in May 1863. 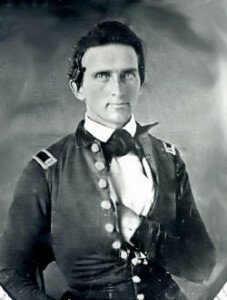 Jackson showed little concern regarding bullets whizzing about him, and on May 2, he was wounded by Confederate troops who mistook his convoy for Yanks. His arm was amputated, and he died of misdiagnosed pneumonia eight days later. Today is a National Day of Mourning in Canada. Not for those killed in wars or natural disasters, but for those who made the fatal mistake of showing up to work. 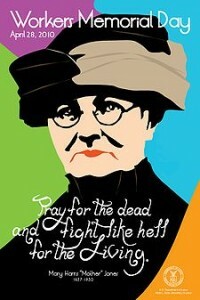 Internationally the day is known as Workers Memorial Day. The date April 28 was chosen because it’s the anniversary of Canada’s Workmen’s Compensation Act, passed in 1914, which created the predecessor of today’s Workplace Safety & Insurance Board. A random sampling of Canadians found that most had never heard of the National Day of Mourning, an effort by the Canadian Labour Congress to spread awareness of workplace safety. However, spokesperson Terry O’Connor believes the lack of safe working conditions is a growing problem in Canada. South of the border, the US Bureau of Labor Statistics reports that fatal accidents on the job have declined since 1994 by 14%, while the number of people in the workforce has increased by the same amount. The most dangerous jobs in North America? Yes, that crab you bite into comes a steep price, and we’re not just talking money. The occupational-fatality rate for commercial fishing is over 20 times the national average. Overall North American working conditions have greatly improved since Upton Sinclair wrote his scathing look at America’s meatpacking industry in The Jungle over 100 years ago. His aim was to raise awareness of the plight of exploited workers, many of them women and children in dangerous conditions for long hours and for the lowest of wages. But the reading public cared more about what was going into their hot dogs (hint: you thought soylent green was nasty?…) than for the workers’ plight. When foreign sales of American meat products declined by 50%, Washington established the Food and Drug Administration to improve the food industry’s appalling standards. It would take 146 deaths in a single day to spark outcry for legislation that would improve workplace safety. The Triangle Shirtwaist Company, the “largest blouse-making operation in New York,” was located on Washington Place and Greene Street in Manhattan’s Lower East Side. Each day 500 workers, mostly young immigrant girls, crowded into the factory. At 4:40 pm on March 25, a bin under a wooden desk on the eighth floor caught fire (most likely from a tossed cigarette). One worker on the 8th floor managed to reach the secretary and swicthboard operator on the 10th floor via telephone. Most of the tenth floor executive staff escaped by climbing onto the roof and into a taller adjacent building. But when the switchboard operator left her post, there was no way to call and warn the 9th floor workers, since all calls had to be routed through the 10th floor. Of the 146 victims, 140 worked on the ninth floor. Fire blocked the stairwell. The one flimsy fire escape collapsed. The owners had locked the ninth floor doors from the outside to make sure the girls didn’t steal. The doors opened inward, so by the time they were unlocked, the doors were impossible to open because of the weight of dozens of screaming employees crushed against them, trying to escape. The fire hoses on the top floors lacked adequate water pressure. The weight of escapees in the elevator immobilized the unit. One girl survived by jumping down the elevator shaft, landing atop the elevator on its last trip. Over fifty workers jumped out the windows of the 9th floor rather than be consumed by fire. When the last one jumped to her death it was 4:57. These tragic seventeen minutes–and the furor that followed–laid the foundation for sweeping changes in the labor movement that continue to protect workers to this day. Below is a list of those killed in the Triangle Shirtwaist Fire in 1911. It was compiled by David Von Drehle, author of Triangle: The Fire That Changed America. A covered pier had to be converted to a makeshift morgue to make room for the bodies. The factory’s owners were charged with manslaughter. “Spring comes early in the Gulf States, and April 26 has been made Confederate Memorial Day by Alabama, Mississippi, Florida, and Georgia. “North and South Carolina have selected May 10. “In Tennessee, the second Friday in May has been made Confederate Day. “Virginia keeps Confederate Memorial Day on May 30. Confederate Memorial Day remembers the Confederate soldiers of the American Civil War, and is the predecessor of the national Memorial Day holiday. 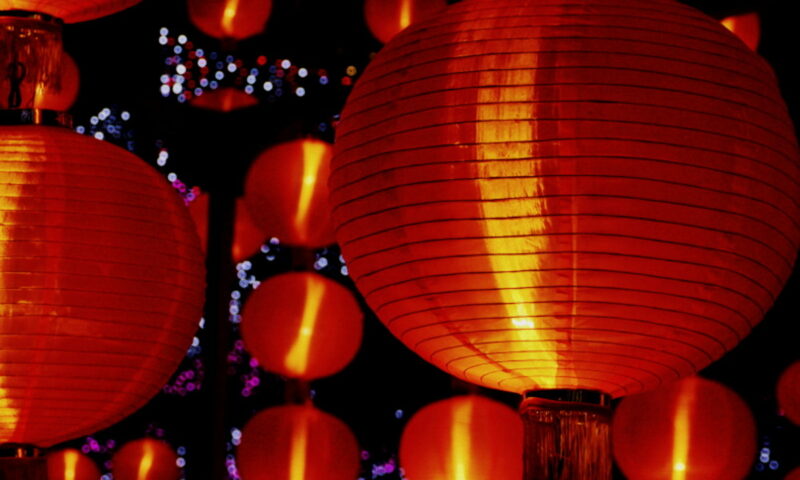 It’s observed on different dates throughout the South. In some states it’s a statutory holiday; it others it’s a holiday by proclamation. Georgia law, for example, obliges the governor to proclaim a holiday on either January 19, April 26, or June 3 (Confederate Memorial Day in Georgia). Meanwhile, Mississippi observes Confederate-related holidays on the Mondays closest to all three of those dates. Why January 19, April 26, and June 3? June 3: the birthday of Confederate President Jefferson Davis. April 26: the anniversary of the single largest surrender of Confederate troops in 1865…General Johnson’s surrender to General Sherman at Durham Station, North Carolina. Johnson’s surrender on April 26 was neither the first nor the last surrender of the Civil War. General Lee had already surrendered at Appomattox Court House, Virginia, on April 9, 1865. Jefferson Davis, meanwhile, wasn’t captured until May 10. 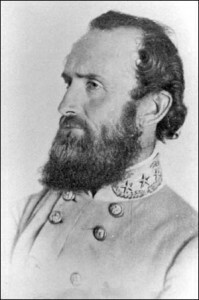 (Also the anniversary of the 1863 death of “Stonewall” Jackson. But General Johnson’s surrender entailed the Army of Tennessee as well as all active forces in Georgia, Florida, and the Carolinas. Nearly 90,000 soldiers in all. The impetus for Confederate Memorial Day, and Memorial Day in general, came from Ladies Memorial Associations, which grew out of women’s groups that supported the troops and cared for the wounded during the war. By 1865, it had become a tradition to decorate the graves of the fallen soldiers with flowers. Several towns claims to have held the first Decoration Day ceremonies, on or around the first anniversary of Johnson’s surrender, including two towns named Columbus. In Columbus, Mississippi, a group of women who were decorating the graves of Confederate soldiers also stopped to place flowers on the neglected graves of Union soldiers. The event made national news. 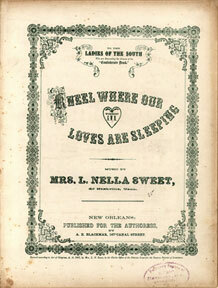 “Who knew the honor of Southern women was at stake during the Civil War? Either way, the song rings true. Last month the nation of Turkey remembered Victory of Canakkale, the World War I campaign that unified the Turkish spirt and brought together disparate elements that would form the Turkish nation. But for every victor there’s the vanquished. The Allies of World War I, including the French, British, Indian, Australian and New Zealanders, suffered a quarter million casualties in the Dardanelles (Canakkale) campaign. At the forefront of the battle, the soldiers of Australia and New Zealand took a disproportional brunt of the death and disease that characterized the fight. ANZAC stands for Australia and New Zealand Army Corps. ANZAC Day falls on the anniversary of the landing of the first Australian and New Zealand troops on April 25, 1915 on the Gallipoli Peninsula on Turkey’s Aegean coast. The assault was ill-planned and inadequately supplied. In the aftermath of Gallipoli a rift widened between the two southern hemisphere countries and the British Empire they had been proud to be a part of. Resentment grew against Allied commanders for the ill-conceived attack that led Australians and New Zealanders like lambs to the slaughter, and for the motives involved in using Australian and New Zealand troops to invade the far-off lands. 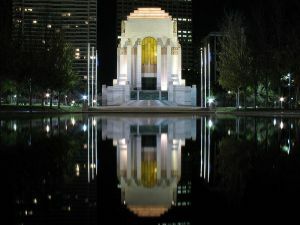 ANZAC Day is one of the most important holidays in both Australia and New Zealand, observed as Memorial Day and Veterans’ Day. For the record, Victory of Canakkale is no celebration in Turkey. It’s also known as “Martyrs’ Day”. The Turks suffered even more casualties than the Allies, around 300,000, in the brutal Dardanelles campaign alone. Today, the monuments and memorials of Gallipoli serve as a grim reminder that in war even the winners pay the price. Hugo died 30 years before the Armenian Genocide of 1915, but his quote could be applied to it—just multiply by thirty. The Armenian Genocide has been called the first genocide of the twentieth century. In November 1914, the Ottoman Empire entered World War I, and immediately met crushing defeats against the Russians to the north. Blaming the losses on Armenian traitors, the government conscripted mass numbers of Armenian men, removed them of their weapons, and forced them into labor camps. The reason April 24 is chosen to memorialize the dead, is because on April 24 over 200 of the most prominent Armenian leaders and intellectuals were rounded up and arrested. Up until then Armenian arrests and executions had not been widely reported. The following month the government announced the Temporary Deportation Law which allowed for the temporary relocation of anyone deemed a threat to national security. In September the Temporary Law of Expropriation and Confiscation expanded their authority: land, livestock, homes, and belongings of Armenians was to become government property. The Armenians were taken to deserts, concentration camps, and other remote locations by the hundreds of thousands. Men, women, and children were either left to starve or executed. The Turkish government today disputes the numbers of those killed, and the extent of government involvement, claiming for example, that many of the deaths were the result of poor farming weather that coincided with the relocation. News of the atrocities were reported in the West at the time, and even the Ottoman’s allies during WWI, Germany and the Austro-Hungarian Empire, expressed concern over the mass deportations and executions of the Ottoman Empire’s Christians. But he didn’t say it out of pity. It was Adolf Hitler, speaking to his generals, using it as a justification for the future invasion of Poland and the Jewish Holocaust.